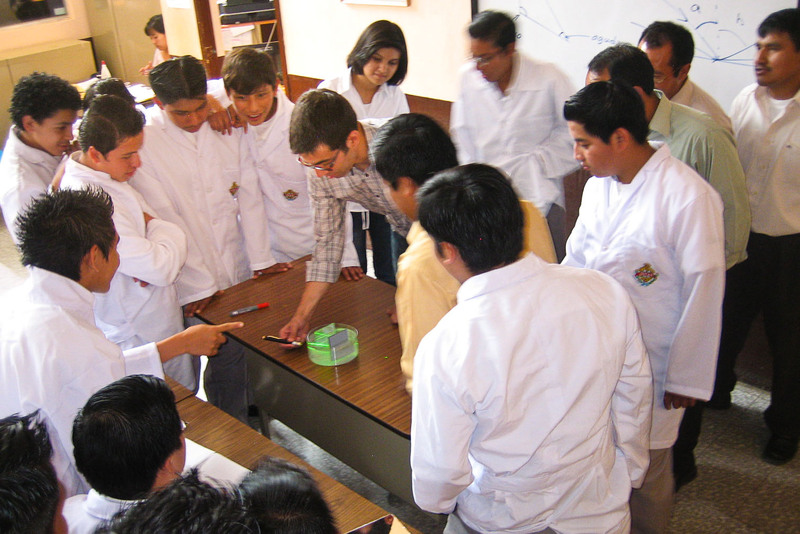 "Hands-on Optics in Guatemala," a hands-on, inquiry-based science exploration activity initiated by Dr. David Scherer of PSI, took place in March of 2010 in Guatemala City and Antigua, Guatemala. The project consisted of developing a Spanish-language version of existing Hands-on Optics modules and providing an outreach activity for students and teachers at three schools in Guatemala. The aim of the project was to disseminate an existing optics education curriculum in a Spanish-speaking country in the developing world. The Hands-on Optics1 modules were originally developed by a grant from the NSF and today operated by a partnership that includes OSA, SPIE, and NOAO. The modules consist of six hands-on, inquiry-based, "laboratory in a shoebox" optics and laser education kits designed for use by middle school and high school students. The "Hands-on Optics in Guatemala" project developed a Spanish-language translation of the instruction manuals for Modules 1 and 6, the two modules that are most related to lasers. These Spanish-language manuals are being provided for use by NSF, OSA, SPIE, NOAO, IEEE, or any other organization or individual for educational, non-commercial use.